HeartStart Adult FRx/FR2/FR2+ AED Defibrillator Electrode Pads may also be used with defibrillators from other manufacturers, using reusable Philips HeartStart Adapters, whether the other defibrillators are biphasic or monophasic, manual or automated. This adapter allows ALS caregivers to connect your Philips electrode pads to their manual defibrillator. This adapter cannot be used with FR2 Infant/Child Reduced Energy Defibrillator Electrode Pads or any electrode pads labeled for use with earlier Laerdal AEDs. 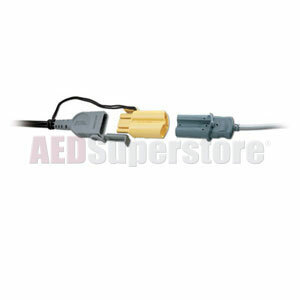 The AED Superstore has a great price on this adapter. To place an order just call us and a friendly, knowledgeable customer service agent will help you. Or, click to add it to your cart to purchase online. It's fast, safe and secure. Important Note: This adapter is not compatible with the LIFEPAK 1000 or LIFEPAK CR-Plus AEDs.